When I was a kid, I thought that everyone ate cabbage rolls. It was just a normal part of my existence with a Hungarian/Czechoslovakian grandmother. 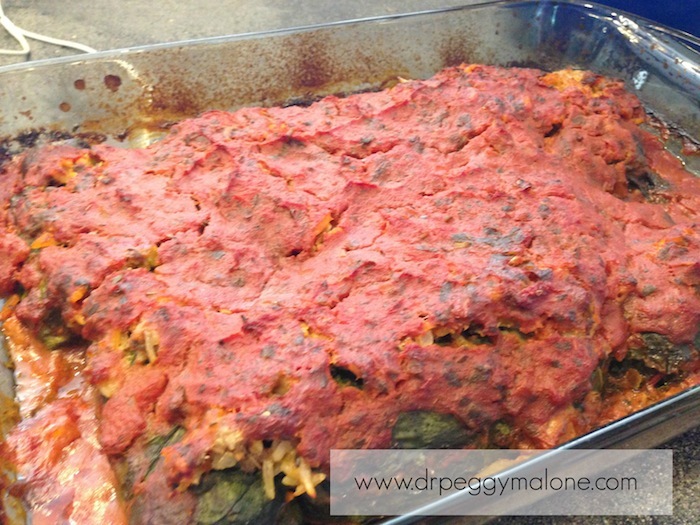 When I think of cabbage rolls, I think of her….in the kitchen, cooking. That’s what she did and she was good at it. When I got older, I realized that not everyone had a grandmother that made these delicious cabbage wrapped meat goodies and it made me feel just a little bit sad for all those who hadn’t had the delicious joy of the cabbage roll experience. 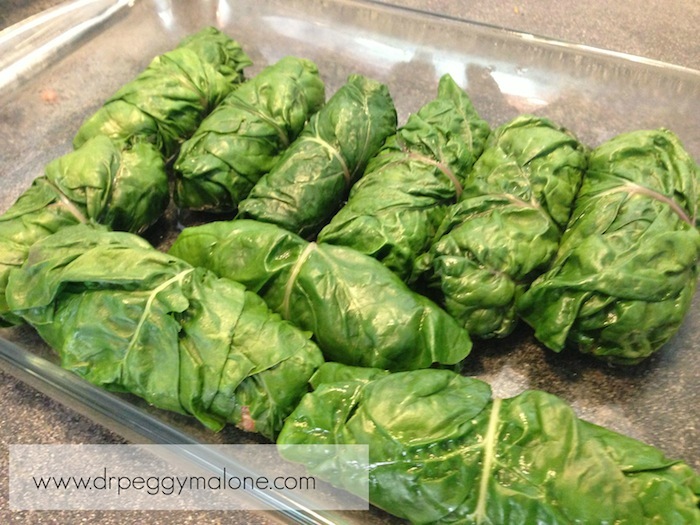 In my adult life, I still love cabbage rolls and with beautiful swiss chard showing up regularly in my weekly CSA (Community Shared Agriculture), I decided to experiment with a swiss chard version of the traditional, grandmother inspired, cabbage rolls of my youth. 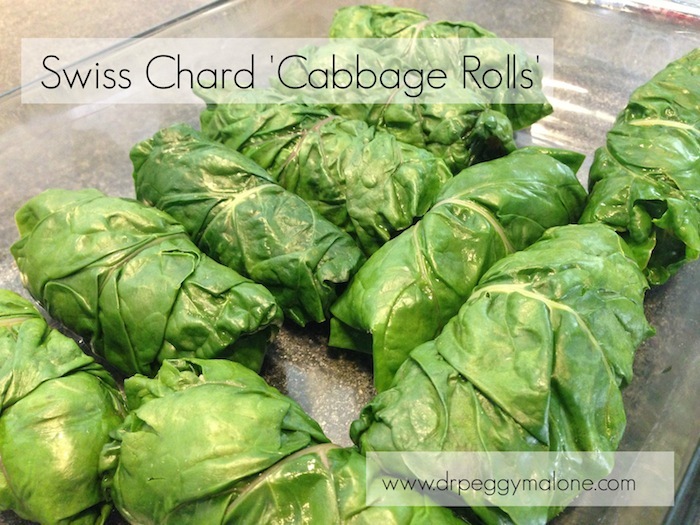 Hence, this summer recipe for these Swiss Chard ‘Cabbage Rolls’. I’ve included a lot of pictures in this post so you can see my process which will make it easier when you make them in your kitchen. You could use ground pork or ground beef. I used pork. 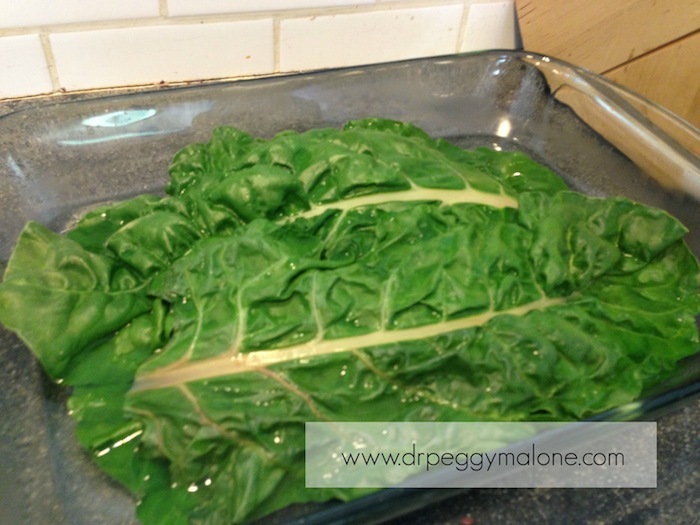 Soak the swiss chard leaves in hot water for approximately 15-20 minutes. This will soften them up and allow for easier rolling. 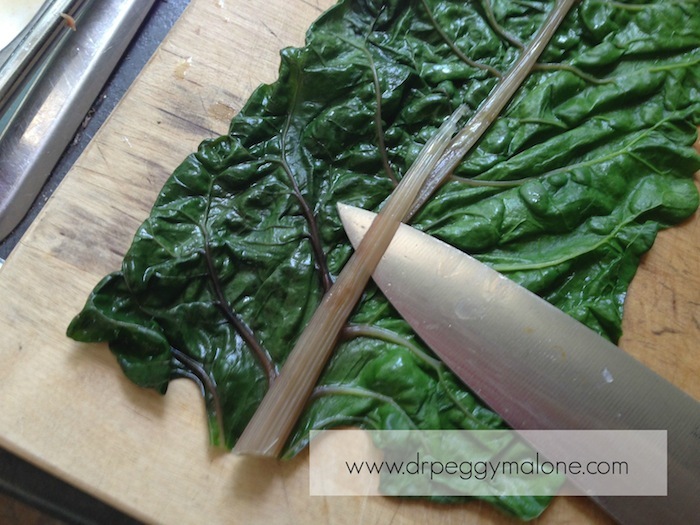 Trim the veins of the swiss chard to make for easier rolling. 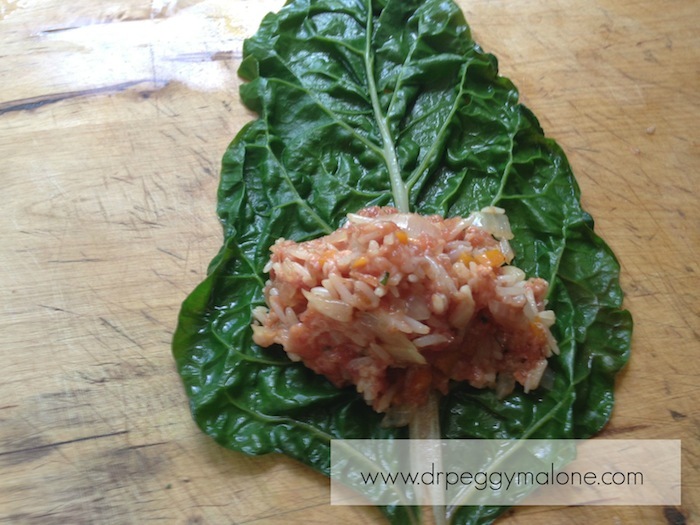 Put a scoop of the meat and rice mixture near the thick end of the swiss chard leaf and get ready to roll. The rolling technique takes a little practice, but after a couple of rolls you should have the hang of it. 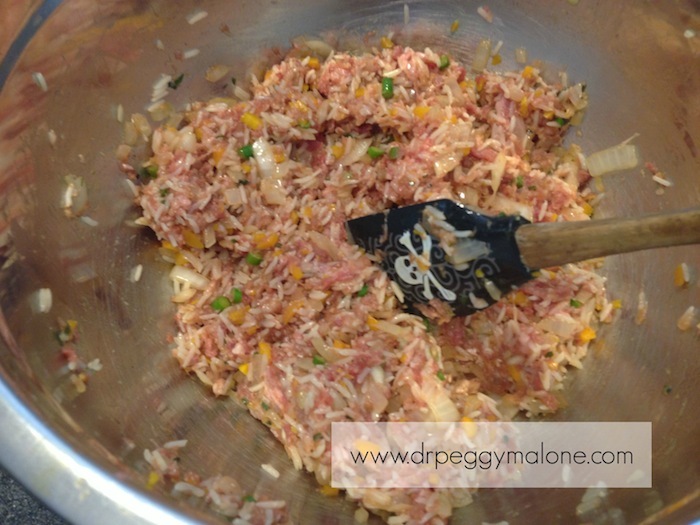 Fold in the edges as you roll the swiss chard around the meat mixture. 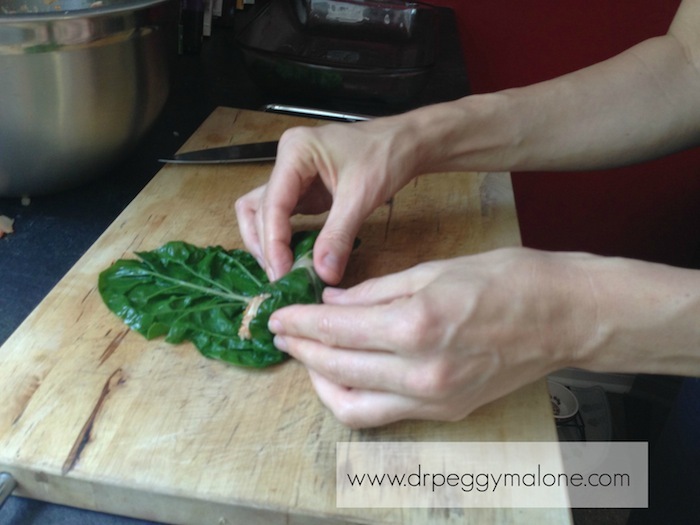 Keep rolling until you have used up your swiss chard leaves. Don’t worry if there is leftover meat mixture. You will sprinkle it on top before you bake. 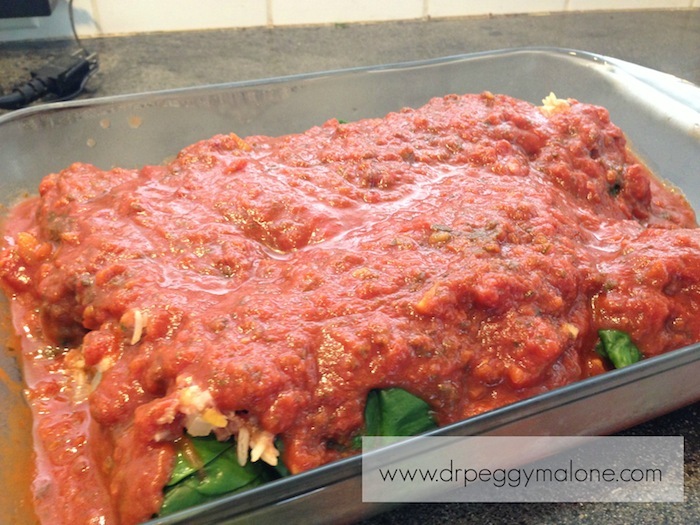 Spread the remaining meat mixture over the rolls and then smother with an organic tomato sauce. Put it in the oven and bake covered with foil for 45 min at 375. Then remove the foil and bake uncovered for an additional 15-30 minutes until it’s bubbly the edges are a bit crisp. A swiss chard take on the traditional stuffed cabbage rolls that your grandmother used to make. Add the cooked rice, all the spices and the sauted vegetable mixture to the meat in a bowl and mix together. Spread any remaining meat mixture over the top of your rolls and cover with tomato sauce. Cover with foil and bake at 375 for 45 minutes. Remove foil and bake for a further 15-30 minutes until it is bubbly and the edges are a bit crisp. With a Polish mother (2nd generation in Canada) I grew up with cabbage rolls on all of the major holidays – Easter, Christmas, Thanksgiving – they were as much part of the meal as the turkey and all the other stuff. I haven’t made them in years so thank you or reminding me of them. The swiss chard is a cool idea and one that I will try. I’ve just started growing my first Swiss chard plant! Thanks for this great idea recipe. I was thinking of making chard sausage rolls. By adding beef or pork sausage with slice carrot and onion in the roll. Thanks for sharing. OMG. This is so good. I put a bit of saurkraut in with the sauce just to give it more balance. Great idea to add the kraut!! I’m sure that would be delish!! Do these heat up well for leftovers? Could this made ahead the night before and baked the next day? I have made them the night before and I just wait until right before I put them in the oven to pour on the sauce so they don’t get soggy. They have heated up well for leftovers for me too! Made these tonight except I was concerned about the spices so I cut them in half. Just delicious and next time I will follow the directions as written. Excellent recipe! 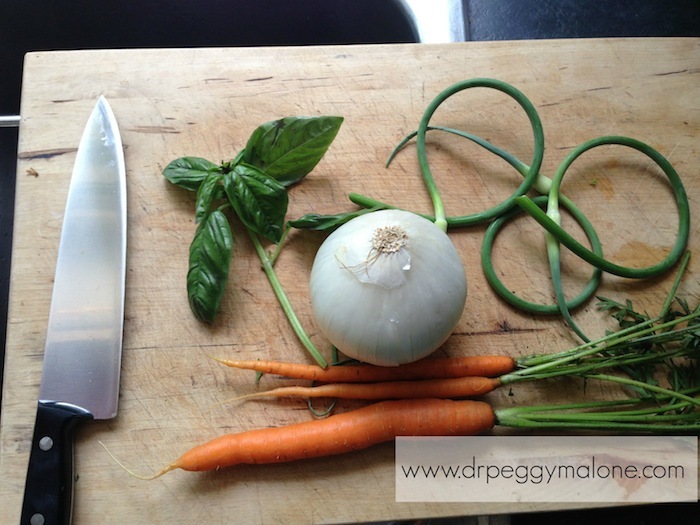 Thanks for commenting on your experience with this recipe Maryjane! I think they are delicious too! I bought a side of pastured pork last summer and I was looking out at all this beautiful chard in my garden. I grow a lot of tomatoes and always have sauce on hand. I hadn’t had cabbage rolls for decades and I loved the ones my mom used to make. I thought, I bet those would make really good cabbage rolls and I was thinking someone must have had that idea. Google it. 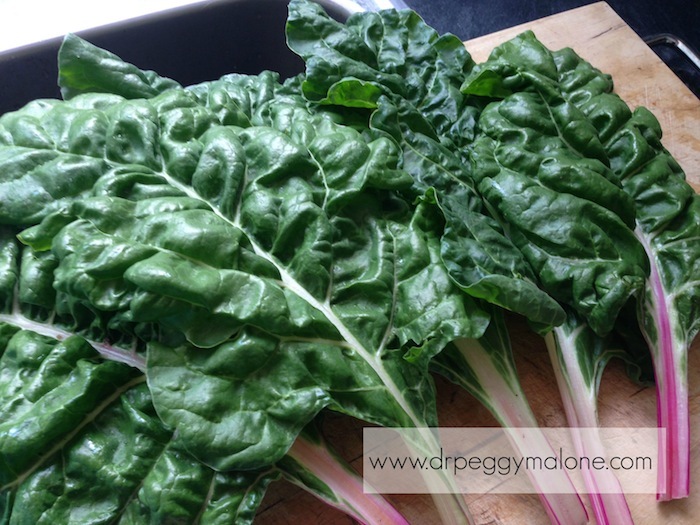 I made and froze sufficient to last me most of the winter and my chard is ready again! Thanks for a great recipe! So delicious. I used chard from my garden and ground pork. Comfort food 101. Dredged focaccia bread through the sauce left on plate. Thanks for the recipe. That sounds great! So glad you enjoyed it!